Muir, who served 21 years in three of Jamaica’s correctional facilities, told the Jamaica Observer that he knew the officer. In fact, he said Gowans was the last officer who, in jest, asked him for a search the very day before his release in 2015. “The day before I left prison he was the officer who see me and him start joke and say ‘come Henzel, give a last search, mi a search; yuh for the last time’,” Muir reflected. 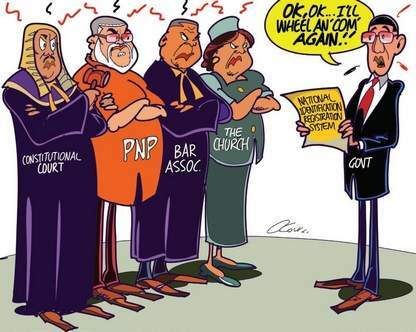 “Him work in a the system for almost 30 years and he wouldn’t want to go, knowing the treatment weh him a go get because of what he bestowed upon inmates like ourselves. So the best route for him was to kill himself,” said Muir. “The correctional officers don’t really know the laws that govern the prison; the inmates know it more. And because of that the inmates always having conflict with them, and that is why I always say it’s not only inmates who need to be rehabilitated, the officers also need rehabilitation. Based on Muir’s records, the typical diet in a day in prison includes boiled eggs with bread smeared with lard and cocoa tea for breakfast; for lunch rice and peas with brown stew chicken; and for dinner cornmeal porridge with bread and kidney. “So there is a big business also going on with the kitchen inside the prison and the inmates’ diet. You have officers who work in the store area and open shop from it. What they need to do to prevent that is to rotate these officers. “The riot took a toll on me; I couldn’t sleep. I was up in the night, just couldn’t sleep, and because of that now it break down my system. I went to the doctor and him realise that mi have a thyroid malfunction. In 1998, I was admitted in the hospital for about five days. “You might see them show videos of inmates in computer labs inside the prison. You believe that? What happen is that a superintendent will call a inmate and say ‘Mr Muir, the Observer is coming here. We want some intelligent inmates to come into the computer lab make them take pictures and so on’. “One day when Arthur Williams visited the prison, the same superintendent calls me and say ‘Mr Muir a minister is coming here, and we told him about the band and the functions of it and I would like the band to set up because he wants to see it’. But a section of the act says ‘all moneys, clothes or other effects belonging to inmate which he is not allowed to retain shall be place in custody of the superintendent, who should keep a list thereof in a book kept for that purpose and signed by the inmate upon admission or on discharge. Why are they charging inmates for his money and the law didn’t say that?”, Muir questioned. “They also breach the Corrections Act by saying that only two person from your family can visit you in prison. The law did not say that. They restrict you and it is wrong. We want to see certain family and we can’t see them. That is a breach of some section of the Corrections Act. As for whether inmates are allowed conjugal visits, Muir replied, “If you want, but if me say anything else it might mash up the process. But conjugal visit is something them must implement because me see situations where inmates couldn’t hold out long and them end up become gay. “But I think it would be a good thing for the inmates, because when them get such a privilege them won’t breach the regulations to lose that privilege.